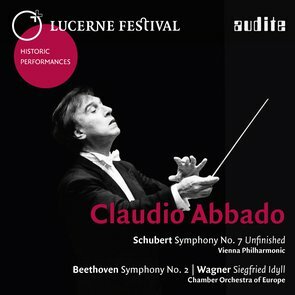 In memory of Claudio Abbado (1933–2014), this new CD represents the first-ever release of three live recordings from LUCERNE FESTIVAL, which Abbado himself agreed to make available in this edition. One is from the summer of 1978, when he led the Vienna Philharmonic in an impressive performance of Schubert’s Unfinished – the same symphony he conducted during his final concert in Lucerne in August 2013. In 1988 Abbado and the Chamber Orchestra of Europe gave the very same program with which Arturo Toscanini had opened the Festival fifty years before. Their program included Beethoven’s Second Symphony, performed with an unbridled energy that was clearly influenced by the insights of the historically informed practice movement, as well as Wagner’s Siegfried Idyll, a work that before now had been lacking in Abbado’s discography. The 32-page booklet, which is in three languages, contains an essay by Peter Hagmann that covers Abbado’s many years of involvement with Lucerne in rich detail and a trove of photos from the LUCERNE FESTIVAL archive. The LUCERNE FESTIVAL Historic Performances series is devoted to making available concert recordings featuring influential Festival artists. For this series, the original tapes receive a careful sonic restoration, and each edition comes with extensive documentation of its historical and artistic significance and value, as well as photos and historical materials from the LUCERNE FESTIVAL ergänzt archive: a history of the Festival in sound.